New Zealand Sindy was made in the late 1960s and looks like a put together doll which she basically is. Pedigree sent Sindy parts to New Zealand to the Lines Brothers factories, where they were put together. In New Zealand they presumably used up all the available parts sent to them, so in that part of the world many Sindy's are found with big pink hard plastic (unbending) hollow legs, and hard plastic miniature heads and arms. Sindy is 11 1/4 inch or 28,5 cm tall and is marked Made in Hong Kong on her waist. Her head is the same as the miniature Sindy head and her Hair colours are brunette, blond and auburn. In 1974 and 1975 a gauntlet arm Sindy was made in Spain for the local market by the Florido company. This Sindy is usually called Spanish Sindy or Florido Sindy. She was made from the same molds as Sindy with the exception of the hands. The Florido hands are more beautiful, very finely shaped, with pointed nails and gracefully bent fingers. Most but not all Florido Sindy have shorter hair then her UK sisters, in the usual colours, blond, brunette and red. She has stick-in lashes and is marked 033055X on her head. The torso has no markings. To the left you will see a Spanish and English gauntlet Sindy so that you can compare the two and above is a close up of the hands, you can now see the superb details on the hands of the Spanish Florido dolls. Fleur doll with the same body. It is known that they had a license from Pedigree to produce Sindy but lost that a few years later and they started to produce Fleur then. Their bodies are marked E between the shoulders and are made from a different, more shiny, orangey vinyl compared to Lovely Lively Sindy, the heads are slightly smaller and the lips are painted less full. These Sindy dolls are found in the Netherlands only and are either dressed as a MartinAir stewardess (the brunettes) or in the Volendam traditional costume ( the blonds). The blond dolls are extremely rare. Another MartinAir doll was produced with the same head wearing the same uniform but on another, basic ( Fleur) body. She has pointed breasts and short unbending arms. All these dolls are hard to find, the faces are unique but the bodies are common Fleur bodies. The dolls have poor quality brunette hair and are marked 033055X on their head and have stick in lashes. The same doll as the MartinAir doll was used for the Volendam Sindy, but the Volendam Sindy was made with blonde hair only and is very rare. She also was only available in the Netherlands. . Her body is exactly the same as the MatinAir gauntlet doll pictured above. 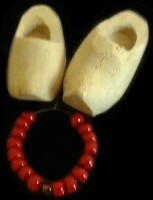 Pictures below are her little clogs and necklace. Link to Volendam in full costume. In 1978 Sindy was first brought out in the USA by Marx. but don't think it was authentic). Sindy has an active body and a new head mold that will be used for all Sindy dolls in 1979. Marx Sindy has 2 GEN 1077 033055X on her head and Made in Hong Kong on her body. Her hair is styled in a chignon, ballerina style. This doll is very easy to find as it was made in large numbers, even if she was only sold for a year or 2 in the US as Marx went out of business in 1979.
the same active body as Sindy, black eyes, black hair and pink lips. Her markings are the same as Sindy's. She was sold in The USA only and is a very collectable and attractive doll.